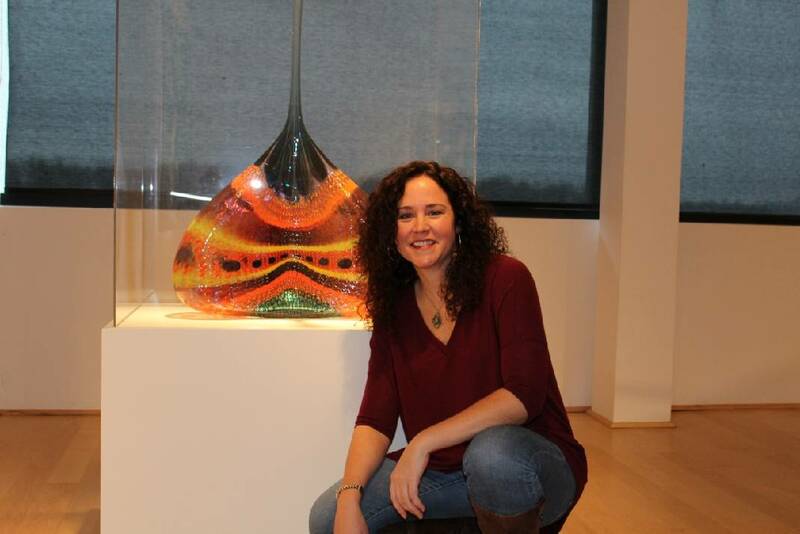 Molly Hussey kneels next to "Torrid Lascivious Gasp," a glass sculpture she chose as her inspiration. Artists and creatives find inspiration in all manner of ways and places. A sunrise, a flower, another person, the ripples in a puddle of water, even a plate of muffins. The inspiration might be a major event such as war or a painful breakup, but sometimes is nothing more than the feeling one gets from seeing a sunset or cracking paint on an old gas station sign. 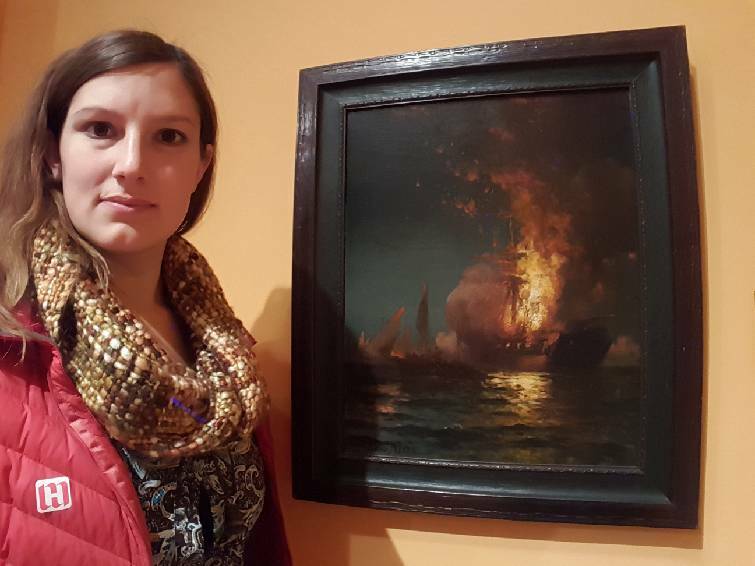 Hollie Berry stands near "Burning of the Frigate Philadelphia," the piece which she chose as her inspiration for the project. Fourteen artists who have studio spaces in Chattanooga WorkSpace, which was created to offer rental spaces to artists and other creative types, were recently challenged to find a piece among the permanent collection at the Hunter Museum of American Art that spoke to them, then create a new piece based on the museum work. And the artists aren't just painters; they also include bakers and musicians. The challenge, which was open to all the workspace artists — almost 30 — and is called Inspired: WorkSpace Artists Inspired by the Hunter Museum of American Collection, was the idea of Chris Thomas, executive director of Public Markets Inc., which manages Chattanooga WorkSpace. It is being administered by WorkSpace Director Kathy Lennon and is intended as merely a fun way to showcase the WorkSpace she says. Still, the artists found both the seriousness and opportunity in the experience, she adds. "Our goal is always to find new audiences for our artists," Lennon says. "They spend their lives being inspired by other things, but this is different. All of them feel like it is an honor that will make them raise the level of their own work. It is taking them out of their own comfort zone." Lennon has been working with Adera Causey, the Hunter's curator of education, on the project. Causey made appointments with each artist and let them tour the museum to find the right piece for them. Each artist was asked to pick a favorite and an alternate choice in case two artists chose the same piece. But that didn't happen. "It's been fun to see their thought processes," Causey says. "I think they are all upping each other's game in this. It's not a competition, but everyone wants to live up to what is being done." "They are definitely taking this seriously," Lennon adds. The artists first visited the Hunter on Dec. 12 and were given a Jan. 15 deadline to let Causey know their picks. The finished works will be revealed at Chattanooga WorkSpace in April at one of its monthly Open Studio nights. Only the 14 pieces in the exercise will be on display. Lennon says the group is working on just how the event will be structured. They might have each person do a presentation about their piece, for example. Artist Molly Hussey primarily works in oil on canvas, creating landscapes through a glazing technique in which she layers paints on top of each other. She says the Hunter project is pushing her to explore, which is why she chose a glass sculpture called "Torrid Lascivious Gasp" by Stephen Rolfe Powell. She didn't know the title when she chose it and has done little research on the artist or the piece, she says. Basically, she simply liked that the piece was in glass and the way it spoke to her. "I on purpose didn't want to look at the title or information about him (Rolfe) because I just wanted to respond to the work," she explains. "I saw a sunset in it, a landscape, even though it's not in same medium. I didn't want to recreate the work because I really want to do the piece from what I see. "I so admire the ability to work in glass. I actually went to Asheville (N.C.) and took a workshop on glass blowing to understand it better and left more in awe of that craft than when I first got there," she says. "I wanted to get out of my comfort box and do something I felt could help me grow." Hollie Berry, who has done murals and oil-on-canvas paintings, has started doing what she calls "torch painting" in which she uses a propane torch to char pieces of plywood. The charred wood contrasts with the original color of the plywood to create "color." She originally thought she would use the horse sculpture outside the Hunter — the one that looks like driftwood but is actually metal — as her inspirational piece, but instead found the painting "Burning of the Frigate Philadelphia" by Edward Moran. She was inspired to choose Moran's work because of its subject of, but not the background or story behind it. She plans to recreate it in the torch-painting style. "The work I'm doing now works well with fire-themed imagery because of the high-value contrast," she says. "Dimly lit scenes translate well into that medium. "I've been looking for anything illuminated by fire and, as soon as I saw it, I thought, 'Yes, I can do that.'"